The smallest unit of human society is a family, which is based on love and compassion. But what an anomaly that the coordinating agency or federating authority of families, which is known as the state, is based on repression and violence! So as it is to change an unjust system or destroy an oppressive state violent methods are needed. Gandhi experienced and realised the cruelty inherent in the anomaly. He felt the depressiveness of the situation. He visualised human society as a family, where love and compassion should be the way to resolve various conflicts. Gandhi introduced non-violent methods based on a threefold action: Satyagrah (insistence to truth), Asagayoga (non-cooperation) and Atmanigrah-atmabalidan (self-abnegation, self-sacrifice). The combination of all of these is crystallized in Savinaya Avajnya Andolan (civil disobedience movement) by individuals and communities against the oppressor and oppressive authority. Gandhi successfully fought the British imperial authority with his non-violent methods and led the Indian subcontinent towards Independence. Buddha7 to Gandhi – Synthesis8 between Karuna (compassion and love) and Pravrutti (worldly life) is evolved. In Islam: Allah (God) is just. He is merciful while giving judgement. He is Rahamanir Rahim (the benevolent, the compassionate). In Islam: Sanctity of human life is propounded emphatically. Equality and brotherhood of human-kind is emphasised. Return evil acts by good acts, and the evil doer will become your bosom friend. We need a forum on the global plane where all people who believe in the sanctity of life would join together in an endeavour to evolve ways and methods based on non-violence for resolving various human conflicts. In the present situation, the UNO, for the cause of people, deploys armed forces to control and suppress different warring groups and countries. Peace imposed by arms is a mirage. Hence the forum’s priority would be to organise a Global Peace Crops. It would comprise of intelligent and self-sacrificing people from all parts of the globe, representing different ethnic, cultural and linguistic groups. When constituted, the corps would replace the armed forces deployed by the UN in due course of time. The members of the Global Peace Corps, with their knowledge and compassionate understanding, would try to dissuade the warring groups and countries from killing each other and forsake the path of violence. In the process, if need arises, the members of the Global Peace Corps would risk their lives by coming in between the warring groups. Sacrifices would continue till the feuding parties agree to settle their disputes by peaceful methods. All those people who have experienced the beauty and joy of life and have ennobled themselves by human kinds aesthetic sensibility and its various creative expression, should come forward and assist the forum in its purpose to evolved and build a society and a system where everybody could partake in this beautiful and joyous phenomena of life, without fear or remorse. After the war between Ram and Ravana, which was fought in South India, the Mahabharat was the most important event of ancient India. It was fought between two groups of cousins – the Kauravas and the Pandvas, in the plains of Kurukshetra near Delhi, in which practically every important ruler from West (Afghanistan) to East (Kamprup Assam) participated. Its exact timing is yet to be determined. It could be done by backward astronomical calculation of timings of the position of stars and constellations as mentioned in the Mahabharat. The destructive power of weaponry used in the war competes with that of nuclear weapons. The impact of ‘Brahmshirastra’, launched by Kaurava’s general Ashwathama, is described by the writer of the Epic Mahabharat in the following words: ‘fierce energy blazed up with terrible flames within a huge sphere of fire. Numerous peals of thunder were heard, thousands of meteors fell and all living beings were overtaken with great dread. The entire welkin was filled with great noise and assumed a terrible aspect with those flames of fire. The whole earth with their mountains, waters and trees trembled.’ To neutralise and counteract that weapon, Arjuna (the third of the Pandava brothers) launched another highly powerful weapon. Before these weapons could collide and let loose destructive and devastating energies and also leave a long term impact of a rainless 12 years, sages intervened, positioning themselves in between the two weapons. They persuaded both the fighters to withdraw their weapons, thus saving the earth and its inhabitants from impending disaster. In the Epic Mahabharat, the writer Sri Ved Vyasa observed that there is no winner in the war; the victor and the vanquished both are losers, the worst losers are people. Since that time an urge to find an alternative to war took possession of the Indian psyche. Rishabhadeo was a king of Ayodhya in ancient times, who introduced agriculture and taught people how to live in harmony. He renounced the worldly affairs for a life on penance, meditation and contemplation to find the Truth (Reality) of life. He experienced that while doing penance, he was bereft of fear and enmity towards all beings – humans, animals, birds, insects and others. In response to this state of mind and feelings, other beings also shed their fear and enmity towards him. It was a stand still situation of Nirvaira (non-enmity) thus the static non-violence. Later Buddha added a new dimension to this state of mind and feelings. He had a novel experience that after one sheds fear and enmity, positive feelings of Karuna (love and compassion) engulfs oneself. This Karuna (love and compassion) permeates other beings who come in contact with the ‘compassionate-one’. Thus is the dynamic of non-violence. Human kind has one qualitative difference from other living species; its urge to know and comprehend Truth and the phenomena of life. And on the basis of that knowledge to coordinate and correlate individual as well as community living with the laws of the universe. There are two ways to understand and comprehend cosmic phenomena; one is to participate in the creative and productive process which leads gradually to widening the horizon of our knowledge about the laws of the universe. It is called Pravrutti Marg. The other is to renounce aforesaid activities for meditation, contemplation and penance to understand and go deep into one’s self. As one is an integral part of the phenomena, by knowing self, one can know that also. It is called Nivrutti Marg. Krishna propounded that one should participate in worldly activities in a detached manner without any consideration of subjective interests. This universe is a playfield of the cosmic being, who expresses itself in manifold ways and myriad forms for the sake of Anand (joy). It is called Lila (dance drama) of the cosmic being. One is only an actor in this Lila (dance drama), so why be subjective about one’s role or its outcome. Rita (law and rhythm) sustains this Lila. To enjoy Lila fully the individual and the society have to tune itself with the Rita. This is the way of Dharma, any individual or group which obstructs this intoning has to be suppressed or eliminated as situations demand. With the common formulation that soul transmigrates from one body to another and the shared premise that attitude and inclination of the being at the time of death determines its next living form and personality; Buddha elucidated later that instead of suppressing or eliminating wrong doers or evil doers, one should educate them and sublimate them by Prajnya (higher knowledge) and Karuna (compassion and love). In the long run suppression and elimination are counterproductive. The eliminated one or ones are born again with the psychic deficiency of the previous birth and thus their obstruction to the intoning of life with Rita continues. In order to achieve the desired results, one should shun the violence in dealing with recalcitrant enemies and instead adopt the path of Karuna to sublimate them. Buddha’s preaching’s did have universal appeal, but its practice was mostly limited to the people who renounced the life of worldly affairs like saints, monks and others. For a common householder and men of worldly affairs detached activities which included violence against criminals and enemies was the way towards higher life. For two thousand years, the people of India, defying common logic, have experimented in various ways in many walks of life to synthesise between two seemingly opposite directions: Pravrutti ( a life of worldly affairs), presupposed violence and Karuna (love and compassion) presupposed Nivrutti ( a life of renunciation). Their success was limited generally to family affairs and immediate neighbourhood. On a wider canvas Guru Tegh Bahadur, a saint and householder of the seventeenth century is a shining example of that experiment. All the way from Anandpur Sahib, a place in Punjab near foothills of Himalayas, he came to Delhi to face the wrath of Mughal King Aurangazeb and resist his drive of forcible conversions in a peaceful manner. He sacrifices his life and that of his camp followers without rancour remorse and enmity at the altar of human freedom. This process continued and Gandhi became the harbinger of a new way. He experimented with and evolved non-violent methods for effecting desirable changes in the affairs of the state and system of governance – bastions of violent authority thus synthesising Karuna and Pravrutti to a great extent. Triloki Nath Purwar was a freedom fighter who participated in 1942 Quit India Movement and was imprisoned for about a year. 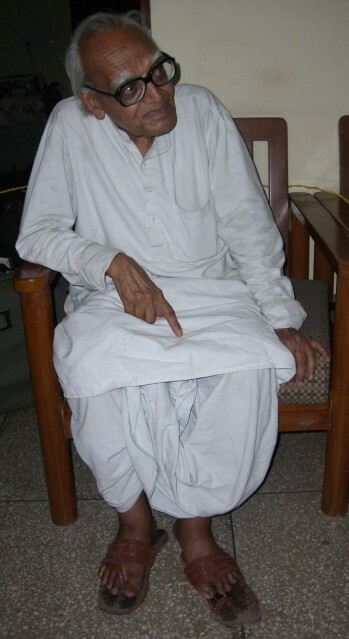 He participated in peoples movement in 1947 in Tehri Garhwal state against feudal order and was imprisoned. After his release from jail he organized a successful non-violent people’s movement and dislodged Tehri Garhwal ruler and handed over the administration to the forces of Government of India. In mid 50’s he went for a study tour in Assam there he came in contact with Nagas and other tribal groups then onward he concentrated on the problems of North East. He came to Delhi and contacted leaders of the Central Government. After their approval he started on a one man’s peace mission in Nagaland. The then Chief Minister of Assam did not appreciate the interference of central leadership in his domain so he was obstructed by state government and was put in jail on false charge of violating inner line regulation. After his release from imprisonment he continued on with the problem. After ten years again in 1963 an understanding was reached between him and Jawaharlal Nehru, the prime minister of India. He went on a tour of Nagaland where he was able to persuade a sizeable number of people to his point of view. The nominated leadership who were heading the state administration felt insecure that they may not be able to find a place in an understanding interfered with his work and forcibly sent him to Shillong. Triloki Nath Purwar came to Delhi and discussed the issue with Jawaharlal Nehru, the prime minister, who hesitated a bit. He then went to Nagaland and started a Satyagrah. There he was arrested and imprisoned. He went on a fast which continued on for forty days, which be broke after a Peace Mission was announced for the Naga problem and state authorities were instructed to make arrangements for travel of Triloki Nath Purwar to either to Bhubaneshwar (where Congress Party was holding its annual session), Allahabad or New Delhi as Jawaharlal Nehru, the Prime Minister, wanted to see him. He reached Bhubaneshwar but he could not see the prime minister as Prime Minister had a paralytic attack. Peace Mission started its activities and Triloki Nath Purwar continued on communicating with his contacts of Naga rebels. Peace mission failed because its member could not understand the Naga psyche and establish a rapport with them. And after that for a few decades he dedicated himself to studies, meditation and contemplation. After achieving a understanding on clarity about his future work, he has decided to resume his activities again for a cause of harmonious human society. He initiated an idea of half million non-violence peace volunteers for stopping wars in the world. Triloki Nath Purwar was active in Bangladesh Movement also. After the independence of the country he never accepted the membership of any political party. He never voted in general elections, he never participated in electoral politics because according to him some aspects of constitution of India are not in harmony with people’s interest.